Pumpkin muffins are given a healthy makeover with this delicious recipe. Made with egg white and with buttermilk and applesauce replacing the butter and oil, these muffins are moist with a cake like consistency. If you like you can top them with a crunchy topping. Preheat the oven to 200°C / 400°F. 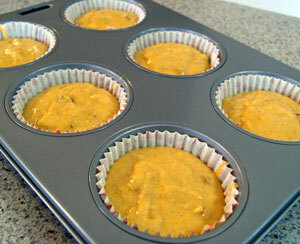 Line a muffin tray with muffin cases or lightly coat with non-stick spray. Place the all-purpose flour, sugar, whole wheat flour, pumpkin pie spice, ground cloves, baking soda and salt into a large bowl and mix together. In a separate bowl lightly beat the egg whites. 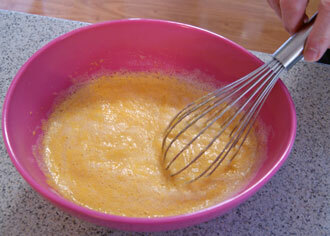 Add the egg whites to the pumpkin puree, buttermilk and applesauce and whisk together. Make a well in the center of the flour mixture and pour in the liquid ingredients. 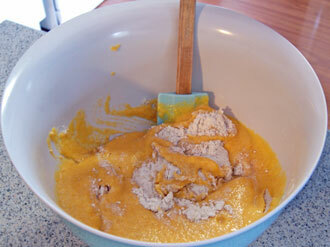 Fold the pumpkin mixture through the flour mixture. Mix until all ingredients are almost incorporated but not quite. Add the pecans then continue folding until just combined and there are no streaks of flour. Divide the mixture evenly among the 12 muffin cases. Only fill about two thirds full. Bake for 17 - 20 minutes or until the tops are firm. Cool for 5 minutes then turn out onto wire racks to cool. Make a crunchy topping by combining 1 tablespoon granulated sugar and 1 ½ teaspoons brown sugar. 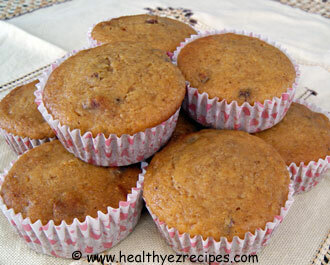 Sprinkle the topping over the muffins, then bake in the oven. Be sure to buy plain pumpkin puree, not pie filling. These muffins are suitable to freeze.